Siamese cat care need not be a huge mystery. These lovely animals are very easy to care for and do a lot of self-care. 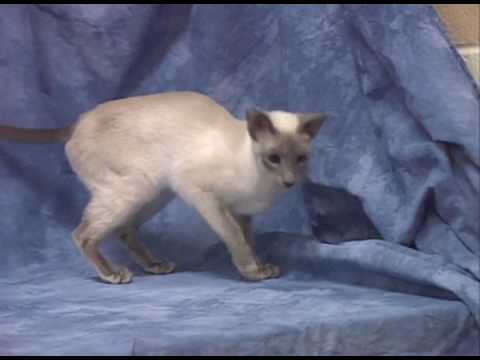 For example, grooming and bathing on a Siamese can be left largely to the cat itself, with the addition of occasional brushing, on account of their smooth, short, and fine coat. The brushing will reduce shedding related issues, like hairballs (yuck). For the most part, doing any sort of bathing is not needed unless the cat has gotten into something they cannot remove from their coat on their own due to safety or health concerns. Cats, including Siamese cat cared for by you, must have fresh food and water. 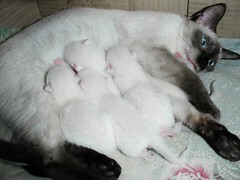 Just because a Siamese is a special breed, however, does not mean they need overly special concerns for their diet. Fresh water is always necessary. A trusted brand of dry food usually is enough to make sure they have their nutritional needs met. One can offer moist food or special formulas as needed by the cat based on factors like age and health. It is a good idea that if you are unable to care for your cat for an extended period that you have either an auto-feeder system or a pet watcher checking on your cat to make sure they always have fresh water and food. No plan for Siamese cat care is complete without doing a safety inspection of the residence that the cat lives in. Naturally curious, perhaps more so then most cats, a Siamese will find things to get into. Mine even liked to knock heavy breadboxes off the top of the refrigerator. You should keep in mind how active and alert these animals are, how able they are with their paws. You may need to use heavy magnetite closures on cabinets to keep the cat out of them. You might need a baby gate, or learn to close doors to the places you don’t want the cat going as part of your Siamese cat care plan. Walk your environment as though you have a young child entering the home and take similar safety precautions. Do not overlook personal supervision as the animal explores the first few times for their safety. Caring for your Siamese Cat here more info from other site.